Vitamin C with Quali-C 1000mg 120 caps. 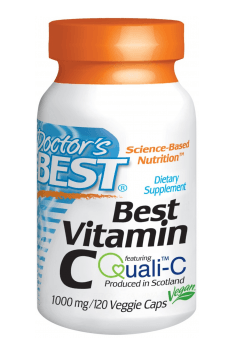 The recommended daily dose of vitamin C is 100-200 mg. However, it is claimed that this dose is decidedly too low, especially in case of lower immunity and colds. In order to support the immune system, the suggested doses are significantly higher and amount to at least 1000 mg a day. There is a way to check the maximal dose our organism tolerates. Just take a determined dose of vitamin C every 15 minutes. When the organism is satiated enough, a laxative effect will appear. Life Extension FAST-C® with Dihydroquercetin provides vitamin C in a fast delivery system with rapid absorption.